I didn't do a post of this series in a while, but luckily I remembered to do today :D We're getting close to the end of Polish Finish Series, there are only a few more finishes I need to talk about. Today's topic is Flakies. Flakies themselves are actually just glitter particles. They're not like "real" glitter, they're rather random shaped and thinner and they shimmer a different way. 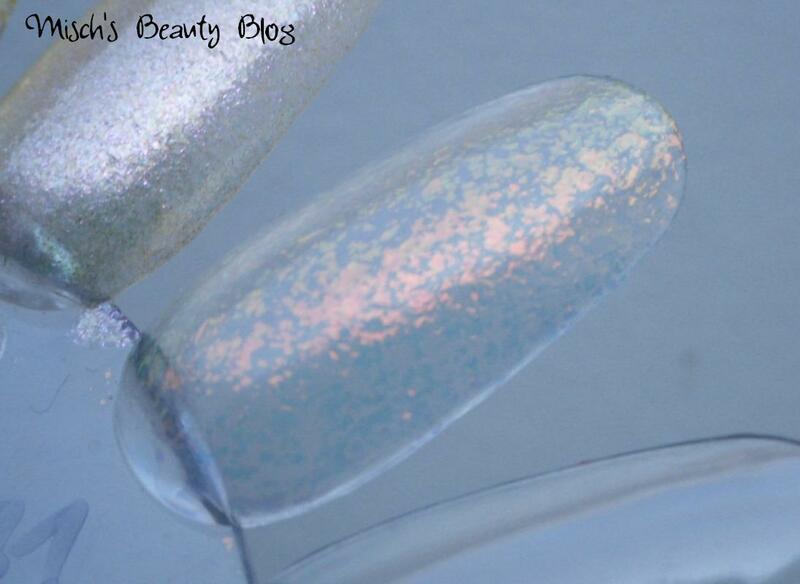 Some like to call them opal particles, which is just the same as the word Flakies. Some of these flakie particles have a duo- or multi-chrome effect to them, that means they change their color at different angles. A very popular version of that is yellow to orange to green. The first one is a very basic flakie polish, a clear polish with the yellow to orange to green multi-chrome. The one I have is Essence's Waking Up In Vegas from their Re-mix Your Style LE of fall 2011. It was limited, but now they have the same polish under a different name in the permanent line. The other polish is another Essence polish, of their Color3 Line. It's a double-ended polish with one shimmer and one flakie part. It's called Midnight Date (City That Never Sleeps). The opal particles are blue and change to green at some angles. After all, I love flakies :) What do you think of them? I have the Waking up in Vegas topcoat too and I'm in LOVE with it. It's so versatile that you can transform almost your entire polish collection with it.